Samuel Freeman Miller became a Keokuk resident in 1850 when he and his family moved from Kentucky. Abraham Lincoln appointed Samuel Miller to the Supreme Court where he served until his death in 1890. Miller's former residence is now The Miller House Museum, located at 318 North Fifth Street. During the Civil War, the presence of the College of Physicians and Surgeons caused the federal government to locate a military hospital in Estes House (formerly at 500 Main Street), and other buildings in Keokuk. Many soldiers from the North and South died at the military hospital during the Civil War and are buried in Iowas only National Cemetery, located here in Keokuk. The city directory of 1868 listed Keokuk as having 21 hotels at one time, nearly all of them between 1st and 14th Streets on (or just off) Main Street. Andrew Carnegies Keystone Bridge Company built a railroad bridge in March of 1871, which linked Keokuks railroads to the rest of the nation. Keokuk briefly had a professional baseball team, the Keokuk Westerns. Their season opened May 4, 1875. They were a part of the National Association of Professional Baseball Teams. Some of the other cities that had teams in this league were St. Louis, Chicago, New York, Philadelphia, and Boston. Keokuk finished the season 1-12 and left the league June 16, 1875. The National League was formed the following year. Keokuk had organized baseball in various forms throughout the years until 1962. Please visit The History of Keokuk Baseball Web Site for more information on Keokuk's role in professional baseball. Rand Park is dedicated in 1883 and named for the mayor at the time, George Rand. A monument honoring Chief Keokuk was placed on his reburial site. Electricity came to Keokuk March 2, 1885, supplied by the Badger Electric Company. J.C. Hubinger opened his starch factory to Keokuk in 1887, producing Elastic Starch. He was also an important figure in The Electric Light and Power Company, Mississippi Valley Telephone Company, Keokuk Brick Company, and the YMCA. He also played a big role in bringing electricity town. In the late 1880s Hubinger built a mansion in the area of what is now 1229 Grand Avenue. The property included both sides of Grand Avenue from 8th to 15th Streets. Included in the landscaping of his home was a pond fed by an artesian well that included an island in the center. The pond was stocked with fish, and there were boats which the public was invited to use. After losing out to larger telephone companies and failing in health, J.C. Hubinger died in a boarding house at 616 High Street in 1908. 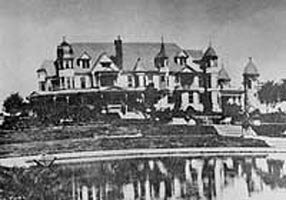 The mansion was razed in 1918. 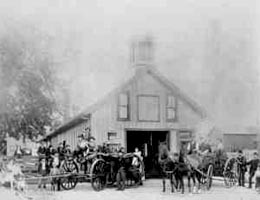 1889 Photo of an early firehouse, located near Hubinger's. This is the Hubinger mansion. The lake in the foreground was fed by artesian wells.